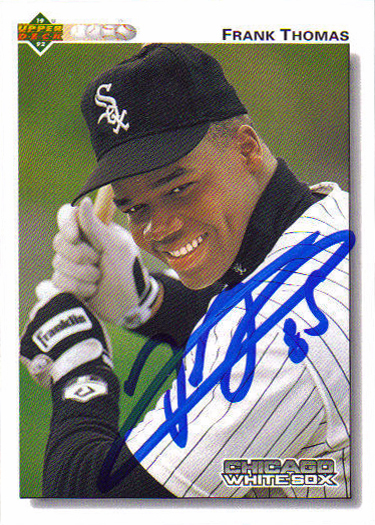 Frank Thomas recently did a signing for Triple Threat Sports in the Chicago area. A collector friend in the area was nice enough to take a few items of mine to the signing. I received them today. Thanks for the help, Donnie! I sent three cards and a jersey. Here they are! I need Thomas on LOTS of cards for assorted projects. Off the top of my head, I can think of about 25 more cards I need signed by him. The reason I chose these three? First, the 1992 Upper Deck Thomas card is one of my very favorite cards ever made. Something about the picture just pops out at me. I went with the two 1993 Upper Deck cards because that is probably my favorite UD set ever produced, so I'd love to finish it as soon as possible. I also like the fact that I have a single card signed by both of my all-time favorite players. I recently sent 3 items to somebody that knows somebody that knows Ken Griffey Jr. He was able to get 2 of the 3 items signed! It wasn't cheap, but I think it was well worth it. The 20x30 photo with Thome is now one of my very favorite items in my collection. Also, I never thought I'd be able to get Griffey for my all-time Upper Deck project!